Economic Feasibility Assessment | Strategic Networks Group, Inc. The Economic Feasibility Assessment is a service SNG offers as an alternative to longer and more costly broadband feasibility studies. It is foundational to a sustainable project and the first step in planning because it answers the key question: Does this digital infrastructure investment pay off for our community / region? Like electrification, broadband is essential infrastructure, where community benefits outweigh investment costs. Electrical infrastructure is a foundation on which communities and economies have been built – those with good quality, ubiquitous, and reliable networks have thrived. With everything going online, communities and economies now need dependable, sustainable and affordable digital infrastructure for all. The Economic Feasibility Assessment can assess up-front whether community benefits outweigh the costs of investing in broadband and digital infrastructure. 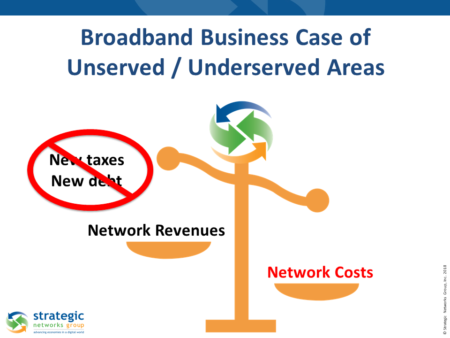 This is critical when unserved and underserved areas do not represent enough of a business case for private sector investment in broadband (where revenues exceed capital and operational costs). 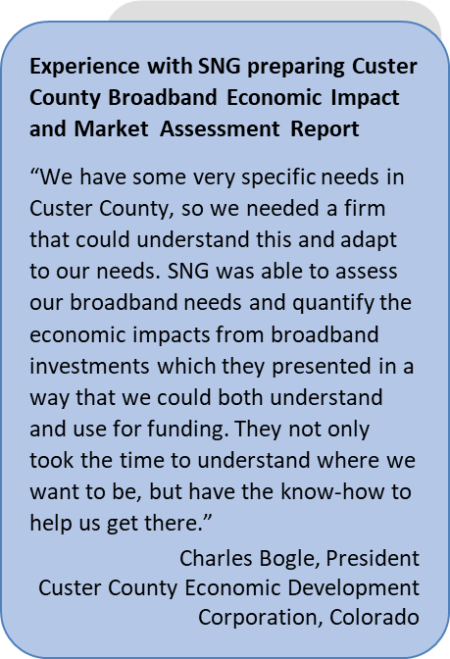 Like other infrastructure investments, the significant long-term community benefits from broadband are drivers that can make an economic case for public investment in broadband, as local leaders decided in Ammon, Idaho, and in Custer County, Colorado. By quantifying the community benefits from broadband investments, a community return on investment (i.e. 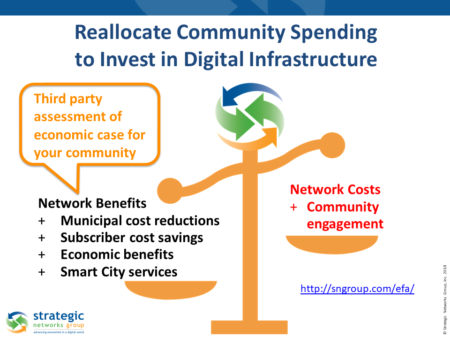 economic case for investing in digital infrastructure and smart community services) can be assessed and compared to the expected costs to build the network. Local property owners, ratepayers and incumbent broadband providers can see where community benefits outweigh the costs and why this is essential local infrastructure. 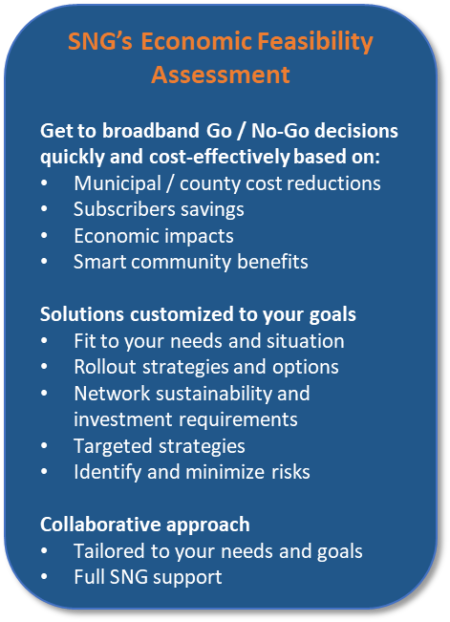 With empirical evidence on broadband access and use, communities and regions have the data points to build buy-in and start a process that plans for outcomes. It is also a holistic approach that engages the community and its providers to address their broadband gaps and future needs. Any community considering taking its digital future into its own hands needs to understand and quantify these community benefits listed above. If they outweigh the costs, then there is an economic case for making an investment in broadband, digital infrastructure and transformation. Recognize that their current state of broadband quality, availability, or affordability is not meeting their needs. Understand that improving their digital infrastructure is essential to the continued well-being and economic growth of their community. Are ready to take action and ownership of their digital future, including the possibility of investing in digital infrastructure and transformation. SNG’s Economic Feasibility Assessment is designed to be cost-effective and quickly completed. Our goal is to enable you to have the data points you need to know quickly and up-front whether economic growth and community benefits outweigh the costs from broadband and digital infrastructure investments – and how to drive that digital transformation. The assessment leverages SNG’s industry-leading econometric and impact analysis, so that you know how your decisions will benefit your community for the long term. 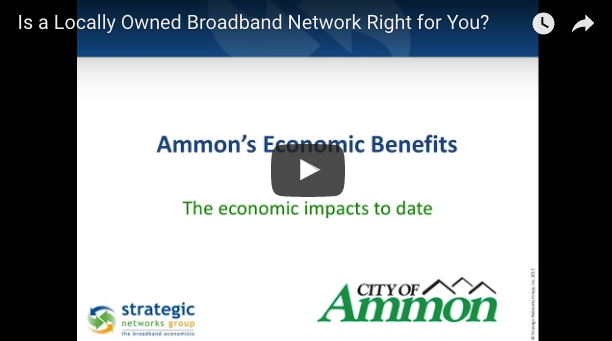 Watch the Webinar: Is a Locally Owned Broadband Network Right for You?